Of all the men commemorated on the Platt War Memorial, the name of James Ryadean is one of the more perplexing. As a surname, it is not recorded in any of the statutory indexes of British births, marriages and deaths, and neither is there any mention of James or his family in the census returns. It may have been that Ryadean was a variation of a similar sounding surname, however, after extensive research using various soundex options nothing has come to the fore. Alternatively, James may have been using a nom de plume for whatever reason, and perhaps wanted to remain anonymous. From information provided on his marriage certificate, we have been able to ascertain that he was born about 1895 and was the son of a carpenter named Henry. James enlisted in Faversham, probably just before, or around the time war broke out, and joined the 1st/1st Home Counties (Kent) Heavy Battery of the Royal Garrison Artillery (RGA), who were headquartered in the town. The battery had been formed in 1908 as the 1st Kent Royal Garrison Artillery (Volunteers) and upon mobilisation in August 1914, to cope with the numbers of volunteers and in common with other territorial units; the battery was duplicated, forming the 1st/1st and 2nd/1st Home Counties (Kent) Heavy Batteries. They were initially tasked with coastal defences at the forts along the south coast and assigned to the 44th (Home Counties) Division. In the autumn of 1914 the whole division was ordered to India; however, James’s battery did not join them and eventually left for France on 28 December 1915. By the summer of 1916, the 1st/1st formed part of the 48th H.A.G. (Heavy Artillery Group.) They were a four-gun battery armed with four 4.7” field guns and saw action during the Battle of the Somme. On 1 July they were based at Berles au Bois in support of the VIIth Corps at Gommecourt and had participated in the pre-battle bombardment the week before. By the end of the war, the battery formed part of the 92nd Brigade however without any surviving service papers, James’ movements are unknown. In late 1917 he is mentioned in the casualty list for 23 October as being wounded in action, however, a month later this information is recorded as being incorrect. James must have returned to the UK during the closing months of the war as he married a local girl from Platt named Annie Matilda Brooker on 19 December in the parish church. At the time of the marriage, James was still a serving soldier and based at Boughton under Blean near Faversham. Annie was resident between Platt and Wrotham Heath at Askew Bridge. 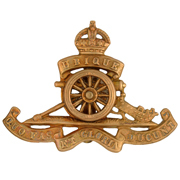 Although the war had ended James volunteered for further service in the Army, and based on the Iraq Clasp attached to his General Service Medal, he must have been posted to or around Ramadi in what was then Mesopotamia, between 10 December 1919 and 13 June 1920. Between July and August, the British Army had become involved in quelling an Arab uprising and James’ unit, the 5th Battery RGA (then comprising of a 6” howitzer, a 60-pounder and two stokes mortars), was besieged at the site of a large refugee camp in Baqubah. James survived the uprising and returned to the UK in early 1922. Unfortunately, his post-war life was to be brief, and he died of tuberculosis in Tidworth Military Hospital, Hampshire on 8 June. His body was returned to Platt and interred in the churchyard. Annie never remarried and lived until 1980.